Whether you work from home or have carved out a space for something you love like crafting, reading, or writing, your home office is a place that should inspire the flow of creativity and allow you to get down to business. But often, that’s not the case. In fact, home offices can be the most neglected spaces in our homes—messy and unfriendly environments for inspiration, driving us to work anywhere but in the actual office, like the couch, or kitchen, or bed (guilty!). 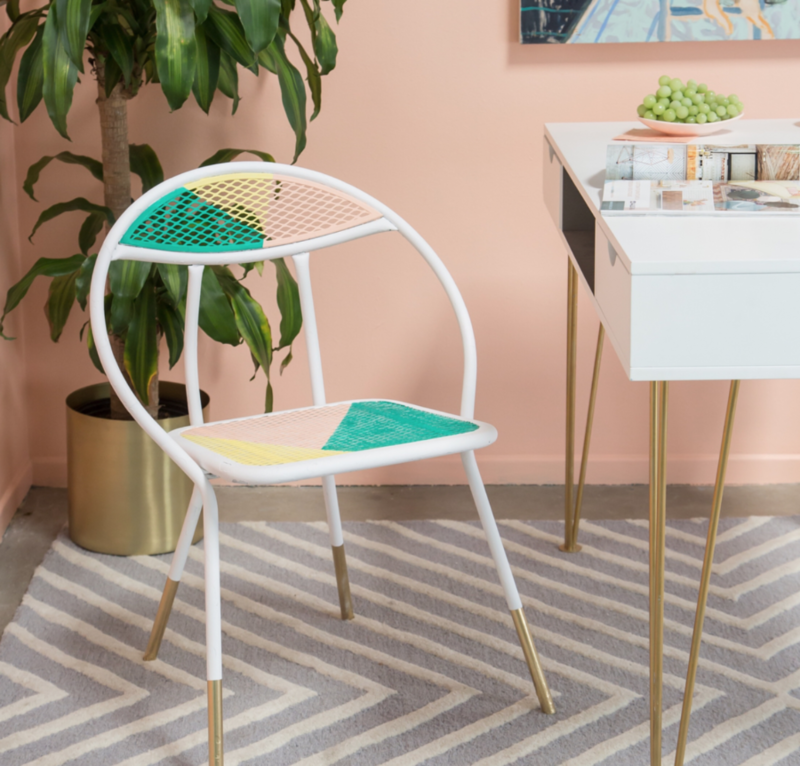 To help you create and update your own inspiring space, we asked experts—from designers to bloggers and editors—for their advice on the best home office updates and small home office ideas that will make you want to buckle down and get to work. Get The Look: One way to glam up a home office is by refreshing your lighting. This eye-catching pendant lamp with gold detailing from Target will give your space a luxurious, yet professional feel. Get The Look: We adore this elevated cute little clay planter—perfect home for a snake plant—to add some dimension to your work space. Get The Look: Dabito is happy to share his genius DIY instructions for his multi-purpose wall shelf/desk. (They’re surprisingly easy to follow, phew!) But if you don’t want to spend your Saturday spray-painting and building shelves this wall unit from Ikea is a similarly chic option that can be up and ready fast! Ground your space with a colorful area rug—for visual interest and soothing sound-absorption. “The multi-colored rug brings in other colors that accent the peach and green nicely, too. But you could also do a neutral gray rug with this color combo. Keep the furniture simple and clean to make it more sleek, and then add in some green foliage to give the room some texture!” — Joy Cho, Founder & Creative Director of Oh Joy! Get The Look: World Market is great for beautiful, affordable textiles, and we’re loving this multi-shaded patterned rug, which works with light blue, plum, apricot, or creamy white walls. Get The Look: This soft space-dyed throw from West Elm is just what your home office needs. Create a DIY blanket ladder, and hang a few wool ones near your desk for keeping warm in winter; switch them out with thin, cotton ones in the summer. Get The Look: We love Minted for their huge, affordable collection of prints. They also provide a free service so that you can text a picture of your wall to their stylists, and they’ll put together a recommendations of art pairings for you. Matting and frames are a way to make art prints look more expensive and styled, but can be a pricey investment. Don’t rule out Michaels—they do custom framing in store! Get The Look: Nothing in the attic? Shop antique stores, flea markets, and even Craigslist to find pieces for your office, whether it’s an aged roll top desk or vintage lamp, and pair these with brand new items, like a pair of vibrant chairs for guests to use when you’re hosting a meeting from home. Get The Look: If you, like Hayley, have an office that also functions as a dressing room/walk-in closet, affix a non-adhesive frosted film to windows, to allow sunlight into your space while maintaining privacy. Get The Look: Whether you’re painting office walls, shelves, and ceiling with one color to make the space feel larger, or using a filing cabinet like this one from CB2 for just a pop of color, working in a color-filled environment can make you more inspired to work from your office—and not the couch. Organization is key—use every trick in the book. Nobody works well in a messy home office. “Don’t waste an ounce of space by tucking printers, filing, etc into corners and in drawers. Use all your vertical space, too, by putting cabinets up to the ceiling with varying types of storage and a wall hanging pin board to help organize supplies that might otherwise end up shoved in a drawer!” — Carly Callahan, Designer at Homepolish and Founder of Callahan Interiors. Get The Look: This is one home office decor idea that’s non-negotiable! Kick off your newfound commitment to organization with this rose gold wall grid.